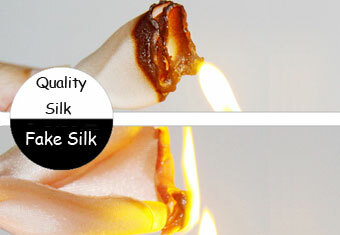 - Genuine quality silk: Burning genuine silk produces a smell very similar to that of burning human hair. The flame is close to invisible when burning the edge of the real silk fabric. Very soon after the flame source is taken away from the fabric, the silk will self-extinguish. - Fake silk: Most fake silk are in fact petroleum based polyester products. When burned, these materials tend to combust rapidly in intense flames, and give a smell of burning plastic. 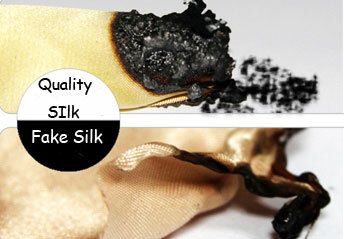 - Genuine silk: The ash from burning is black, crispy and turns to powder easily when grinded. - Fake silk: The ash of fake silk tend to be sticky, twisted, and difficult to break apart.